Sherrie Scraps with passion: Thank You treat favor! I hope you had a great 4th of July weekend! We had a wonderful time enjoying all the festivities. We met my daughter, son in law and Arya at the parade. We all had such a great time but we definitely wore little Arya out! A fun weekend by all! I think the adults liked them as well as the kids did, lol! These cute little lollipop holders are made with My Creative Time's Stitched Lollipop Holder metal die. The fun paper is from Creative Imaginations. I tied on a fun polka dot bow and added a cute little tag. The tag is My Creative Time's Teeny Tags Layering metal die and the sentiment is stamped with the Teeny Tags Greeting stamp set. These went together super fast. So, if you are looking for a quick treat idea and/or need to make a large quantity, this is perfect. You can switch up the paper to match any occasion! Super cute Sherrie, I love that die. Great papers and cute bow, too! Oh Sherrie, these are so cute. Loving the bow, I hope you had a great 4th of July with your friends. Sounds like you had a fabulous weekend!!! LOVING those bags ... the bows are fabulous!!!!! Sounds like a fun filled weekend my friend! 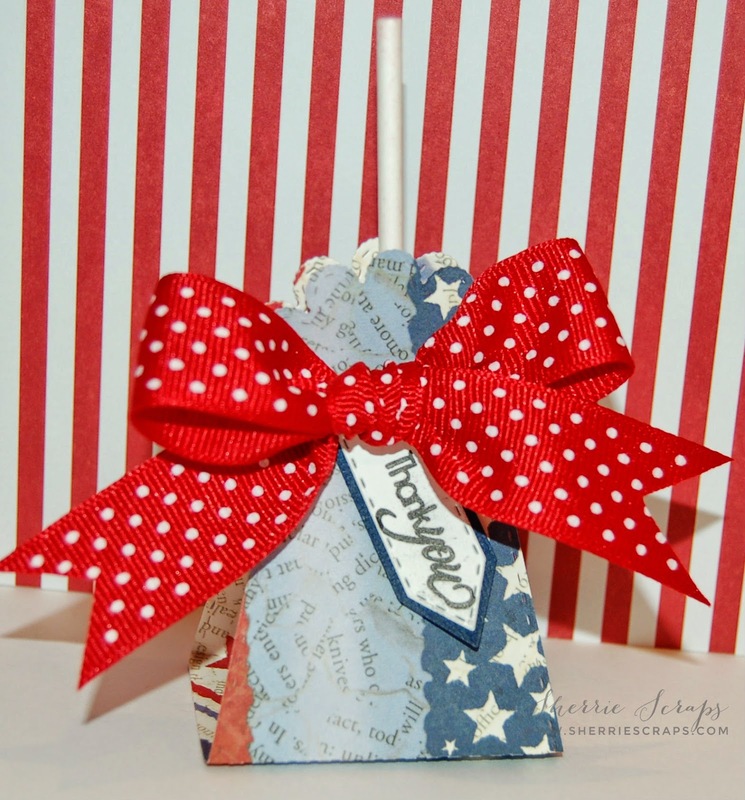 I am loving your red white and blue lollipop holders. That big red polka dot bow is so much fun - what a cute treat! These are just super! Love that ribbon. Have a great week. Such a cute little treat, love the paper!! Fantastic package! 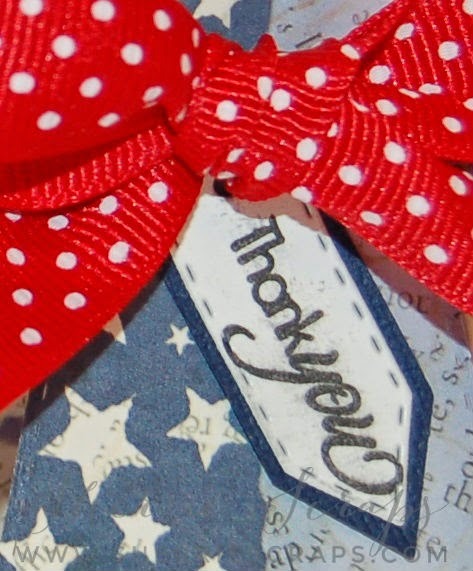 Love the red, white and blue and the bow is gorgeous! Thanks for joining FCCB challenges! These are so absolutely adorable, Sherrie!! I love the paper!! Those bows are ah-may-zing!! 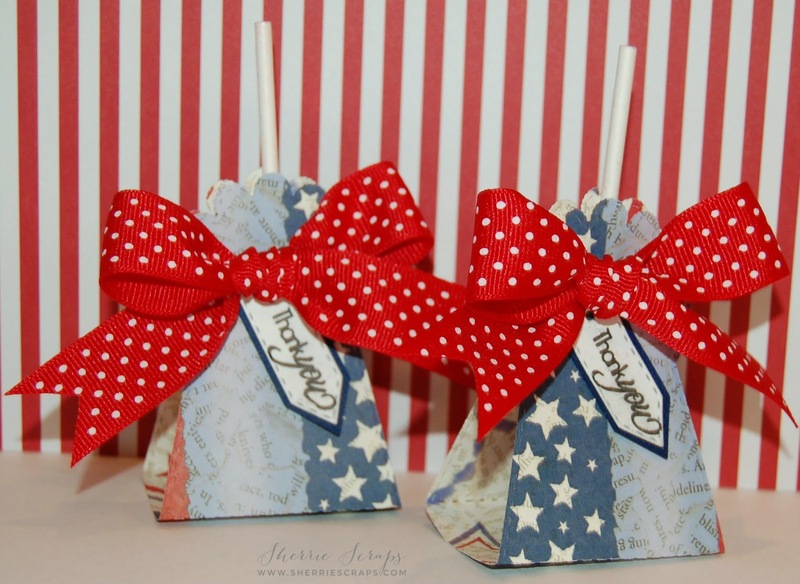 What perfect patriotic treats!! Love them!! Thanks so much for playing along at DTC!! I'm so glad you had a wonderful holiday!! Poor little Arya and her face plant :/ I'm so glad she wasn't hurt!! The resiliency of children is amazing!! All of your activities sound so fun!! I live just outside of the city and my neighbors aren't really close by but everyone within a 10 mile radius decided they had to set off fireworks from Wednesday - Saturday well into the night. Ugh. It wouldn't have been so bad but the weather was beautiful - 70's, so the windows were open. Some of those firecrackers sound like gunshots!! I meant to send you a message earlier about your question on where I got the May Arts ribbon...sorry!! I actually got it at Ben Franklin online about 2 years ago. I got three or four big rolls and I'm hoarding it as much as possible. BF doesn't sell craft stuff online anymore :( I got most of my early Spellbinders, MME papers and so much more there. Their prices were at least 40% lower than anywhere else...maybe that's why they couldn't make it selling online!! One of the rolls of ribbon is my absolutely favorite and I don't know the name of it to look for more. It makes the most beautiful bows. I'm getting so low I'm starting to panic a bit :( If I can find somewhere that sells it at a good price, I'll give you the info. What lovely creations and a great idea. Thanks for playing along at Loves Rubberstamps. Wow! Sounds like you had an amazing weekend celebrating with family and friends! Your little treat holders are fabulous! I'm not surprised that they were such a hit with all!! So cute no wonder they were a hit!!! Sounds like a wonderful time! Congrats to you as well my friend at MCT! I was excited to win with you! The feedburner worked again for like a day then stopped! Ugh! Sherrie ~ These are ADORABLE!!! I know they had to be a HUGE hit too! Well you sound like you had a wonderful weekend! Busy but packed with lots of fun and good times! Sounds like you had a fun filled weekend. Your lollipop treat holders are too cute. Love the papers and that beautiful ribbon. Have a creative day. Fun weekend! Awesome!!! I love that die, one of my favorites! What a fun weekend full of awesome activities! Sounds like a perfect 4th of July celebration! I LOVE these treat holders, Sherrie! Your paper is super fun too! These are a must try :) Thanks so much for sharing with us over at Decorate to Celebrate! My dear friend, I apologize for being behind! My arm is still super painful and I've been unable to come here the last several days. Your lollipop holders are amazing! I LOVE your paper choice and the bright red bow. What a lovely gesture and such a sweet project, as always... I'm not surprised they were enjoyed by all. :o) Have a wonderful day, Sherrie! These are amazing my friend !!! I love these !!! Awesome Treat. Love how this turned.